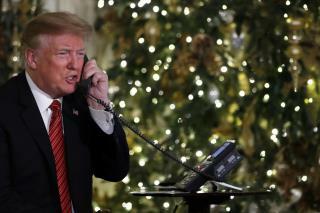 (Newser) – A 7-year-old girl who talked to President Trump on Christmas Eve still left out milk and cookies for Santa despite the president telling her it was "marginal" for a child of her age to still believe. Then again, Collman Lloyd of Lexington, SC, says she had never heard the word "marginal" before. Collman had called the NORAD Tracks Santa program Monday night to check on Santa's journey delivering toys, reports the AP. In an interview with the Post and Courier, she said the scientist who answered the NORAD phone asked her if she would like to speak to the president. Six minutes later, Trump was on the line. "Are you still a believer in Santa?" Trump asked. When she responded, "Yes, sir," the president added, "Because at 7, that's marginal, right?" Collman didn't know what "marginal" meant and simply answered, "Yes, sir." Trump closed by saying, "Well, you just enjoy yourself." Only Trump's end of the conversation could be heard by reporters, but Collman's family later posted video of the call on YouTube. Collman told the Post and Courier that she and her 10-year-old sister and 5-year-old brother left iced sugar cookies and chocolate milk for Santa. She reported that Christmas morning, the food was gone and presents were under the tree. Trump scrapped plans to celebrate in Mar-a-Lago and spent a rare Christmas in Washington because of the shutdown. "I thought it would be wrong for me to be with my family," he told reporters in the Oval Office after talking with members of the Army, Navy, Air Force, Marines and Coast Guard. "My family is in Florida, Palm Beach, and I just didn't want to go down and be there when other people are hurting," Trump said. He didn't say which family members were at Mar-a-Lago. Trump doesn't know what most of the words he uses mean either. I'm sure the kid just knew that some strange, stupid, jerk named Donald was bad-mouthing santa. Funny reading all the liberals fake outrage on this since they are the ones who for decades have been trying to remove God, Christmas, and Christianity out of our public schools and society. Trump's three adult children spent their formative years with their mother and her parents, which is why Don Jr speaks Czech. Tiffany Trump shows up for photo shoots and young Baron spends his time with his grandparents after school. Trump has never been around kids, not even his own. Ivanka tried modeling,but even after a nose job and breast implants, she didn't go far. Don Jr has admitted to drinking alot in college and Eric was just out there,babbling.. But Weiselberg got them " jobs" at Trump Org. Eric now has a small winery to keep him away from politics, and Ivanka landed Kushner...who could not get into Harvard until Charles K (dad) ponied up some money. Jared lost his security clearance over mounting concerns that financial exposure to his company’s $1.4 billion mortgage payment at the 666 5th Avenue office tower would be a problem. Then something mysterious happened after Trump was elected.....a “handshake” deal was executed to save 666 5th Avenue and the Kushner Companies from defaulting on their loans. SWEET! Who in the world could cover that......well, that could be why Jared is so close to the Saudis. Don Jr is sketchy but used to claim real estate as his job while Ivanka still has her pricey handbags and shoes made in Indonesian sweat shops.